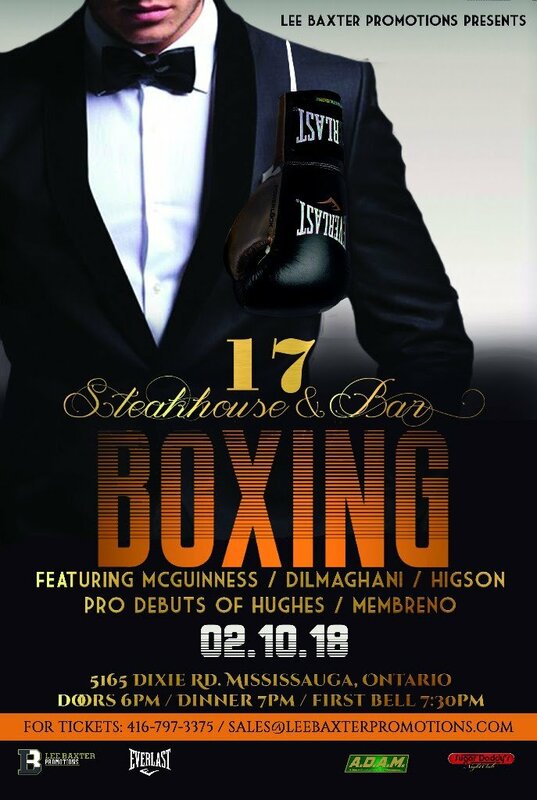 Three of the best Ontario-based fighters in the sport today will be in action on February 10, as Lee Baxter Promotions presents its first show at 17 Steakhouse & Bar in Mississauga, ON. In the main event, Logan Cotton McGuinness will return to the ring for the first time since March of 2017, when he suffered his lone career loss to Horacio Cabral. The former WBA-NABA featherweight champion returns in the very city where he first became a household name in Canadian boxing. “Logan has battled through a lot both professionally and personally over the past year. In my opinion, he’s in the best condition mentally and physically that I’ve ever seen him in. The fans of Mississauga adopted him many years ago, and it’s the most fitting place for him to be making his return,” said Baxter. McGuinness’ stablemate Alex Dilmaghani will continue his march up the super featherweight rankings in the co-feature. The UK-born product has honed his craft all over the world, including at the Romanza Gym in Mexico City under the guidance of Hall of Famer Nacho Beristain, but has made his fighting home in the Toronto region. Dilmaghani most recently defeated the rugged Tuomo Eronen on November 11, showing a world-class punch output and sublime defensive skills. In addition, the Canadian super welterweight champion Kevin Higson will be in action, fresh off his first title defense over Phil Rose. Higson hasn’t lost a fight since 2016, a loss to Martin Islas which he has since avenged. The night will also feature the professional debuts of both Roland Membreno of Brampton, and top 140-pound prospect Martin Hughes. Doors will open at 6:00 PM ET, followed by dinner at 7:00 and the first bell at 7:30.